Being undeclared is an opportunity for students to explore majors that align with their interests, strengths, and goals. The Academic Advising Center is here to help students in exploring and finding their major. Undeclared students have to declare a major by the time they complete 60 credits. Students declare a major by completing a Change of Major/Minor form to the Office of the Registrar. If you are undeclared or want to change majors, the Academic Advising Center can help you. You can make an appointment to meet with an advisor by calling the AAC at (714) 744-7959 or in person at Beckman 405. Download and print the Change of Major/Minor Form. Meet with the Department Chair of the Major to get their signature on the “Change of Program” Form. You can find the Department Chair on the Advising Portal. Turn in the Change of Major/Minor form to the Office of the Registrar. Please note: To declare some majors, there may be an application, audition, or portfolio review process, or a set of courses that must be completed with certain GPA requirements before being permanent in the program (see above). Change of Major/Minor Program Forms submitted at the Registrar's Office during priority registration dates will not be processed until the conclusion of the registration appointment period. View the list of majors and minors at Chapman to make a list of your top majors of interests. Review the College Catalog to view major requirements and courses. Take courses for your General Education requirements and electives to explore majors. There is a document called "Exploratory Courses for Chapman University Majors" that lists courses to explore majors and also count as General Education courses. Make an appointment with your Academic Advisor at the Academic Advising Center. To make an appointment call (714) 744-7959 or in person at Beckman 406. Make an appointment with a Faculty Program Advisor. 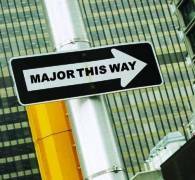 Every major has a Faculty Program Advisor and it’s a good idea to meet with Program Advisors of the majors you are deciding on to learn more about the major, courses, and declaring the majors. The list of Program Advisors can be found on the Advising Portal. Visit the Office of Career and Professional Development in 342 N. Glassell (Green House next to Fowler Law School). career self-assessments and Career Educator staff that you can meet with to explore careers. an online Major Portal which can give you an idea what careers students can do with a particular major. Join a Student Club or Volunteer opportunity. Visit the Student Life website on ways to get involved on campus. » How Is College Different From High School? Chapman Majors - there are lots of options to choose from! View a list of all degrees and programs.